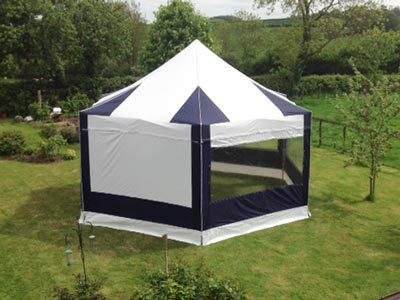 A range of flexible tents that allows you to turn almost any size or shape of area, whether it be hard standing or grass, into a special individual party venue. Link together to create interesting shapes, or fit to your party space. Providing Innovative, stylish cover for dining, dancing, drinking and partying! Add floor covering, dance floor, stage, bar, lighting, LED up-lighters, spot lights, round or square tables, and chairs. These images show picture window sides, for a light airy feel. Solid sides, in white or blue, are also available. 6m hexagonal can link to other hexagonal tents or to a 3m x 6m rectangular or 3m x 3m square creating interesting party layouts. 3m x 6m rectangular tents can link to create 6m x 6m square, or 3m x 12m. The latter could make a long dining or dancing area, or act as a covered walkway. The 3m x 3m can be standalone or link to house our purpose built bar, or stage. Perfect for catering requirements too.